I must have been bored to add this to my netflix cue, or I caught a glimpse of it on TNT and decided it was worth the rental subconsciously. Either way, it wasn't too bad a choice. 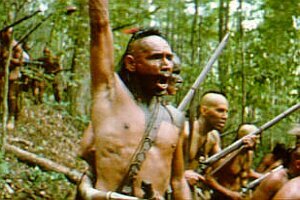 Last is a period piece that doesn't try to teach you some invaluable lesson like Magua. His devotion to revenge was played out really well, and his overall character comes off as almost psychotically dangerous. For me he was the real reason to watch the movie, even though he is the villain. Still, other characters and situations that appear to be really trite and cliche end up working out a lot better than one would expect. The DVD is somewhat of a disappointment since it was the first time I had to select a non-anamorphic setting on my projector. There really is no excuse for any movie now a days to not be 16x9 enhanced. The overall picture suffered from this decision, with a lot of loss of detail and softening of the picture. The Dolby Digital 5.1 soundtrack was quite good, pulling off that haunting theme music very well. The French attack on Fort Henry was very well articulated with the deep sound mix. Overall I wouldn't give this movie much more than you're typical two-hour evening-killer. It doesn't redefine the film industry but it is an overall good time, and like Desperado, you can probably drag the woman to see it without too much trouble once you mention the star.